Following the purchase (and return) of a Navman S80 Deluxe GPS, I plunged for the TomTom Go Live 540, and haven't regretted it since. GPS - 9/10 - A well engineered device, with good quality accessories. Flexible, adaptable, re-configurable. There is a different blog entry for the Live services, which can be found here. The TomTom Go Live series in the UK has the TomTom Go Live 540, Tom Tom Go Live 740 and Tom Tom Go Live 940. You can buy add-on maps at a later date, so it is possible to buy the 540 and add the Europe Maps with an online download. One other difference is the MP3 license. The 540 does not come with an MP3 license, so you can't use it to play music whilst you drive. The GPS itself is extremely well built, with a slightly rubberised casing, which makes it easy to grip. The large wide screen is extremely clear and easy to see. The GPS comes with a windscreen mount, which has a screw-fitting to enable / disable the suction cup, making it very easy to fit and remove, and very secure once installed. The docking station is robust and heavy, and doesn't slide around on the desk when the wind blows the USB cable. I have had the GPS since December 2008, and have been extremely happy with the quality and accuracy of the maps, and the navigation method. Middle of the screen brings up the main menu. Bottom of the screen brings up the current route navigation meu. Right of the screen brings up the traffic menu. The Arrow icon shown on the screen brings up a configurable quick menu. You can also add a Voice Control icon to the screen (see voice control below). 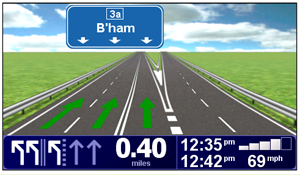 Planning a route is extremely easy - you can just hit the screen, and select 'Navigate To'. Or you can pre-plan a route, which is particularly useful if you are inside and out of GPS reception. 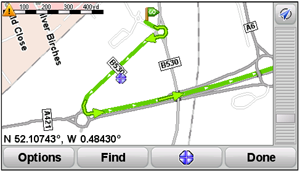 When using the TomTom Services, you can also do an online search, and navigate there. There are two different types of voice you can use on the GPS, Sampled Voices and Computer Generated Voices. If you use the Sampled Voices, you can have characters such as John Cleese telling you to "turn around and place the car in the opposite direction to the way you were previously facing", however, John's voice cannot synthesise all of the road and street names in the country. Hearing street names means that you don't need to look at the GPS at all to check which turn it actually means - this makes driving with this GPS even safer. When I drive in to work, it will say to me things like "Go around the roundabout, second exit, A1, towards Stevenage". Technology has got to a stage where it is beginning to be difficult to tell when the voice is computer generated. The two UK English voices (1 Male and 1 Female) are very clear and easy to understand. With the clear screen and the comprehensive voice directions, it makes things very easy to drive, and you rarely have to interact with the GPS itself. The only real time that you may need to look at the device is to navigate complex junctions, to verify that you are in the correct lane, going the correct direction. For this, the advanced lane guidance comes to your aid. This system presents a large full-screen image of the exit, so all that is needed is a glance. This is one of the areas where the TomTom comes into its own, up and above the other offerings, such as the Navman S80, reviewed earlier on this blog. 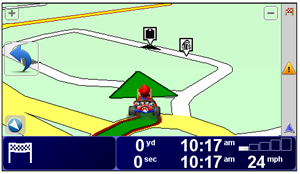 Maps are procured by TomTom from various different map providers around the world. For the UK, the map provider is the same as the one which supplies Google Maps. 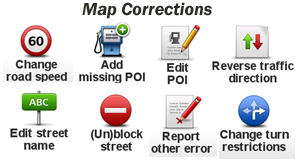 I have used the "Report Map Error" feature a number of times, and recently checked on Google, and saw that one of the modifications I had made (identifying a road as being a footpath, and naming it "Old Tram Road") has made it from my GPS to TomTom, to the Map Provider, and to Google within about 6 weeks. It is highly likely that you are on the road when you spot a map error. It is possible with a quick link on the screen, to bookmark a site which needs correction, and make the correction when you get home. This includes renaming roads, changing road directions, renaming or moving points of interest, and reporting new safety cameras. "Navigate to the Nearest Cash Machine"
I bought a TMC cable with the TomTom - these contain an FM radio aerial, which you drape around your windscreen. 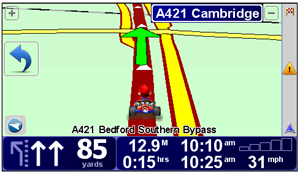 In the UK, Classic FM transmits the TMC traffic messages for motorways and major roads. If you have an active subscription to the TomTom Live Services, this will always override the TMC traffic function. The TomTom Live Service now works in other countries without any additional subscription, so all you need to have are the maps. There is little need for a TMC cable (it is only useful if you do not have any Live coverage, which is rare). I would recommend buying a TMC cable when you need one (perhaps travelling to a country that supports TMC, but not Live services), not when you buy your Go Live GPS receiver. When I bought my GPS, I intended to use the live services for the free 3 months, and then go on to using the TMC cable, however, the Live Services have a much better reception than TMC, far better coverage, and other useful features, such as an itegrated Google Search for locations. See the Live Blog Entry (comming soon) for more a much more thorough write-up. Excellent review, thanks for that. I often travel and constantly try something new. I like to use various innovative things, especially when it comes to a comfortable journey on the car. Recently tried this software official site, here I found many interesting features that I have not seen before. This software is useful for inexperienced travelers, as you can use the full version of the software for three kneading, and then purchase a license if you want it.